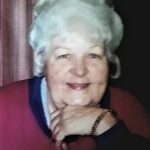 Marjie Ruth Wearden, age 86 of Granbury, Texas, went home to be with her Lord, Monday December 3, 2018. Service: 2:00 P.M., Saturday December 8, 2018, Triple Cross Cowboy Church; Interment: Holly Hills Memorial Park; Visitation: 6:00 – 8:00 P.M., Friday December 7, 2018 Martin’s Funeral Home. Marjie was born on November 9, 1932. She was an active member of Triple Cross Cowboy Church for many years. Marjie loved people; everybody knew her as “Nana.” Marjie loved her God, family and football; especially the Dallas Cowboys. She managed the office at Brazos Medical and the Lunch Box for many years. Marjie came to Granbury in 1971. She was preceded in death by her two brothers, two sisters, parents and a great-granddaughter: Zoe Grace. Marjie is survived by her children: Rick Fleming and wife Dee of Fort Worth, Texas, Lydia Miller and Nacho Alvarez of Granbury, Texas, Roy Wearden of Fort Worth, Texas; six grandchildren: Cody Davis of Barry, Texas, Kyle Fleming of Burleson Texas, Jason Fleming of Granbury, Texas, Najla Gergab of Granbury, Texas, Ross Wearden of Fort Worth, Texas, Nadya Williamson of Granbury, Texas; nine great-grandchildren and two great-great grandsons. Marjie was known to me as Mom and I was Fluff to her. Loving with her, We had sooo many memories from Music with favorite singer George Straight to favorite actor Tom Seleck. We had some wild travels to Dalhart Tx and her letting me have beer. Lol. That’s memory I’ll keep to myself lol but none the less, she was the life of the party and what I do miss was her big soft hugs. Mom, you were a FANTASTIC Woman! And I Thank You for all that you were! R.I.H. Prayers and love to the whole family.